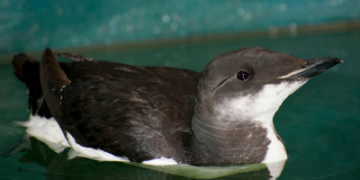 On March 5, a thick-billed murre was found in a driveway in Wilmington, MA emaciated and exhausted, but alert. Thick-billed murres spend all their lives at sea. They breed in arctic waters and can be found off the coast of Massachusetts in the winter. These types of sea birds are commonly blown ashore during intense winter storms. It is likely that this bird was blown off course during our first March nor’easter. With some initial intensive care, and then continued supportive care with a whole lot of fish to eat, the murre is did really well and gained lots of weight. While here, the murre enjoyed its time in the seabird pool fishing, diving, and preening on the way to its successful release back into the wild on March 24.